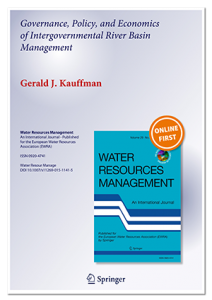 This article examines governance, policy, and economic complexities of intergovernmental river basin management. The watershed or river basin approach is examined within the context of integrated water resources management as a means to efficiently manage interstate river systems. Organizational, institutional, and budget structures of watershed management models are explored and benchmarked with economic performance measures of prototypical river basin commissions in the United States. River basin organizations such as the Delaware River Basin Commission have the requisite authority under Federal/state compact to manage a river as a single entity provided financial structures are in place to sustainably fund water resources programs in interstate basins. To sustainably finance watershed programs, river basin governance organizations would benefit from revisiting the economic user pays principles long practiced in Europe, Latin America, and Oceania and advocated by the continental-scale European Union Water Framework Directive.